All visitors to Carrickfergus Harbour and Marina should contact the Carrickfergus Marina Office on VHF channels 80 and M2; or by land line on 028 9336 6666 for berth allocation. The information provided in relation to depths at Carrickfergus Marina and Harbour are guidelines only. As the facilities are situated on the Carrickfergus Sandbank, depths may reduce as a result of siltation. It is the responsibility of the skipper to satisfy themselves as to the availability of depths for their vessel at any particular time. It is our aim to provide an efficient and courteous service to our customers to ensure a pleasant stay at our 5 gold anchor award winning marina. 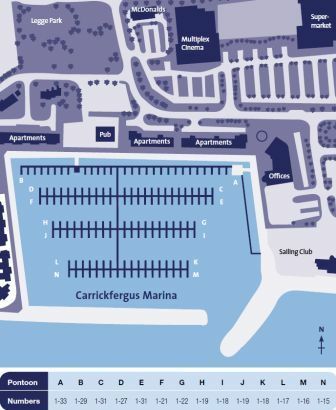 In the purpose built 320 fully serviced berths at Carrickfergus Marina and Harbour basins, both behind rubble stone breakwaters, 6m - 12m bespoke pontoon berths are available to accommodate your stay. Carrickfergus Harbour HW as Dover, Rise 2.9m (9’6”) SP: 1.8m (6’) NP: is situated on the Northern shore of Belfast Lough to the west of Carrickfergus Castle. The Marine Services facilities are located on the southern end of the west pier as is a purpose-built Marina basin accommodating 10 boats in pontoon berths behind rubble stone breakwaters. This basin is partly dredged to give depths of up to 2.9 metres (9’6”) at L.W.S. 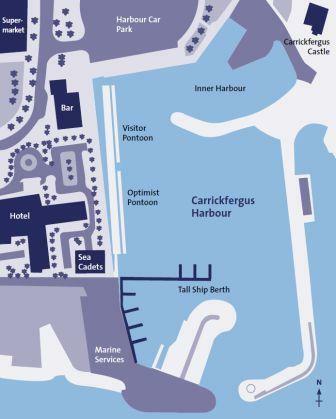 Carrickfergus Harbour also has an inner harbour area accommodating up to 36 boats and a public slipway that is accessible 3 hours either side of high water. The entrance to the Harbour is open to the South and is dredged to 2.3 metres (7’6”) at L.W.S. The ends of the east and west piers are marked with red and green beacons showing Fl. G 7.5s 5m 4M and R 7.5s 5m 4M. Navigational marks are located within the Harbour defining the approach to the harbour basin. Pass between two navigation perches marking the toe of the internal breakwater and revetment. Turn to port to approach pontoons and marine services site leaving the second breakwater perch to port. Note presence of isolated tubular piles in central harbour area. Leave these piles to port on approach to harbour slipway and inner harbour berths. Carrickfergus Marina HW as Dover, Rise 2.9m (9’6”) SP: 1.8m (6’) NP: is situated on the Northern shore of Belfast Lough 330 metres to the west of Carrickfergus Harbour. It is a purpose built Marina basin to accommodate 280 boats in pontoon berths behind rubble stone breakwaters. The basin is dredged to give depths of up to 2.3 metres (7’6”) at L.W.S. The entrance to the Marina is situated at the Eastern end of the basin and is open to the South West. The ends of the two breakwaters are marked with red and green beacons showing Qk. Fl. R 7M 3m and G 8m 3M. Red not showing from 245°to 305°. The light defines the centre approach line on a bearing to the entrance 321°T/141°T. All visitors to Carrickfergus Harbour and Marina should contact the Carrickfergus Marina Office on VHF channels 80/M2 or by land line on 028 9336 6666 for berth allocation. Disclaimer: Whilst every care has been taken to ensure accuracy in the compilation of this information, Mid and East Antrim Borough Council cannot accept responsibility for claims, errors or omissions.